The Union Cabinet’s decision to allow Indian private airlines to fly on foreign routes, barring the Gulf sector, deserves to be welcomed. In fact, once the restrictions in the international sector were eased for foreign airlines, there was no reason for not allowing the country’s private airlines to go global. As the nation – and many of its neighbours – grieves its dead after the tsunami visitation, there is the inevitable remorse about lack of any kind of early warning. Since the waves struck India some two hours after they started in Indonesia, couldn’t the public be warned somehow? THE immediate response of Indian corporates towards the victims of the tsunami disaster has been positive, and prompt, with leaders among the blue-chip companies and banks offering help in cash and kind. Nations, like individuals, ought to make New Year resolutions. Individuals, however, have the universal tendency to forget their resolutions after the celebrations are over; nations cannot afford to forget theirs. Progress of a nation depends on its ability to think of the promises it can make to itself and the doggedness with which it can keep these. The second millennium was at its fag end when we decided to celebrate and welcome the third one at no other place than beautiful Shimla, hoping in addition, to enjoy the excitement of an expected snowfall. As the country enters the New Year 2005, the Left parties, who play a crucial role in the survival of the Congress-led UPA government at the Centre, have a daunting task of re-defining their role in the future. Last Sunday, while we savored the Christmas week-end and were planning our New Year parties, a massive earthquake sent waves of calamity around the Bay of Bengal. In a few moments, thousands perished, without warning or reprieve. The Union Cabinet’s decision to allow Indian private airlines to fly on foreign routes, barring the Gulf sector, deserves to be welcomed. In fact, once the restrictions in the international sector were eased for foreign airlines, there was no reason for not allowing the country’s private airlines to go global. The two airlines to take off first would be Jet Airways and Air Sahara which meet the stipulation of carriers with at least 20 aircraft and five years in the business. The two airlines are already flying to Nepal and Sri Lanka, although the state-owned domestic carrier, Indian Airlines, was operating on these routes along with a number of other international sectors. Indian Airlines also benefits from the move towards opening foreign skies, as it can fly further East to Japan, China and Australia, besides heading for destinations in the UK and the US. In a related decision, the Cabinet decided to phase out the practice of demanding compensation from foreign airlines through commercial agreements. The discontinuation of these agreements would contribute to a level playing field, enhance operational viability and result in reduced fares. With private airlines moving in to the airspace that was protected till now, passengers can look forward to lower international fares – not only from the new entrants but from foreign airlines too who have to match the emerging competition. This, in turn, would compel Air-India and Indian Airlines to become more efficient and competitive by offering attractive fare options and better services. If Indian Airlines has become more passenger-friendly in recent years, it is thanks to the way its top brass met the challenge from the private operators. It is hard to grasp the logic of the Left in opposing this decision and pleading for the protection of ‘national carriers’. The poorer sections do not use airlines and the less affluent users actually stand to gain from more players and better competition. The boost to travel, tourism and aviation would spur expansion of the economy and employment. As the nation – and many of its neighbours – grieves its dead after the tsunami visitation, there is the inevitable remorse about lack of any kind of early warning. Since the waves struck India some two hours after they started in Indonesia, couldn’t the public be warned somehow? That question is uppermost on everyone’s mind. This regret has become all the more severe after it was revealed that scientists, some of them of Indian origin, working on the tsunami challenge, had been trying to persuade the Indian government to join the international network against the killer waves. We never did. Science and Technology Minister Kapil Sibal has explained the line of thinking of the babus in so many words. He says in his typical courtroom style that since the last tsunami in India was in 1883, the government never thought of setting up an early warning system. 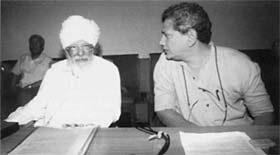 “Tell me,” he argues, “if I had asked for funds for the purpose, what would be the response of the Planning Commission?” Indeed, the hide-bound bureaucrats, always so eager to save a penny, have fulfilled their mission but have lost the lives of thousands of innocent people in the bargain. What has been done cannot be undone. But at least now somebody should learn to think of worst-case scenarios. The adage that whatever can go wrong will go wrong sooner or later is not just a joke. Things will now have to start from scratch. Apparently, the tsunami threat was never factored in while constructing the Kalpakkam nuclear plant. The country will now have to learn to be safe after being very, very sorry. Ironically, even now India has decided to strengthen its own network instead of joining the world tsunami warning system. There is a niggling fear that this might be carrying nationalist feelings a little too far. Natural disasters know no borders and the country’s isolated network may not be up to the task. No disrespect meant, but our weather specialists have not been very successful in predicting the monsoon. Would they perform any better while handling the threat from the sea, that too in a matter of minutes and not months? THE immediate response of Indian corporates towards the victims of the tsunami disaster has been positive, and prompt, with leaders among the blue-chip companies and banks offering help in cash and kind. The lead taken by companies like Bharti, Reliance, Infosys and the Shipping Corporation of India is welcome, as are moves made by banks like the State Bank of India, Punjab National Bank and ICICI Bank. Of course, many others are following suit. At the time of a national crisis every section must extend a helping hand to those who need it the most. This is a task that is too important to be left to the government alone. Over the years, India Inc has sought and found increasing say in issues of governance. This also entails responsibilities. The government is moving men and materials to the affected areas, but there are constraints, often bureaucratic, that are all too familiar to all of us. The corporate sector must step in to help in those areas. The public distribution system in India is hardly an example of performance; many corporations have distribution systems and infrastructure that are far superior to what the government has. Surely, they should use it to get help from all over to where it is needed the most. It is surprising that the pharma sector has as yet not made available enough free medicines for the needy. Some transport companies are helping out with the delivery of relief supplies, but more should move in during these next few days. Once the immediate needs of the victims have been taken care of, the corporate sector has a role to play on a long-term basis too—in building housing, helping restore the infrastructure, giving soft loans, and even writing off debts in certain cases. No matter which economic model is followed, paramount importance must be given to helping those in need. India Inc is on the right path, and it needs to travel more on this road. Like most individuals, India has been casual about many of its commitments and the tasks it has been assigning to itself since Independence. The year-end is also an occasion for shedding much of what is considered unwanted and for ringing in the new. During the year which is just slipping out of its hands, India ought to have shed much more of its baggage but it simply did not. Like a grandmother, India is reluctant to give up its psychological attachment to the old and the unnecessary. It doesn’t mind carrying the burden of the past even if it has already bent its back, occupied its mental space and blurred its vision of a better future. The nation inherited both hope and despair from the last year. Headlines spoke of the big changes India experienced early in 2004, but these were on the surface, in a way cosmetic. Only characters in the ongoing serial called India changed, not the essential India. Realities on the ground continue to dampen hopes. For its own health, India should have made an effort to tackle corruption, criminalisation and casteism that are having a baleful influence on Indian democracy. Neither the NDA, nor the UPA government, seem to be interested in fighting these evils. The nexus between politicians and bureaucrats, criminals and the corrupt in many states has become too formidable for the present-day political establishment to tackle. The Telegi and dozens of other scams are going to cast their shadow in the New Year also. Fairly early in the year the parliamentary elections, however, brought intimation of what was described by many as the Big Change. Despite the predictions of the opinion and exit polls, the NDA government led by no less a leader than Mr Atal Bihari Vajpayee lost the elections, making way for the Congress-led coalition at the Centre. At the close of the year, the political scene still projected a fractured picture making people wonder whether the country would face political uncertainty because of skewed arithmetic of the new Lok Sabha. The Congress celebrated its return to power by electing Mrs Sonia Gandhi as Leader of the Congress Parliamentary Party, but she surprised the nation by nominating Dr Manmohan Singh for the Prime Ministership instead. With one rare act of sacrifice, possibly of shrewdness, she won over critics who were uncomfortable with the idea of India being governed by a foreign-born citizen. By choosing to abdicate Prime Ministership, even before taking over, Mrs Sonia Gandhi gained in popularity and in the process deprived the BJP of what could turn out to be a divisive issue. At the end of the year, the arrangement between Mrs Sonia Gandhi and Dr Manmohan Singh was working to the satisfaction of both — one running the party; the other, the government. His selection gave the feeling that even in a democratic polity full of serious shortcomings, a man of integrity and character can reach the top. Dr Manmohan Singh and Mrs Sonia Gandhi have promised a lot more than mere replacing a BJP-led coalition with the one led by the Congress. It remains to be seen whether they can accomplish what they have promised. They are facing no fewer hurdles than Mr Vajpayee did. A working democracy requires a consensual political culture which at the end of the year seems to be missing in the country. While it requires a certain kind of humility on the part of those who win elections, it also requires ungrudging acceptance of defeat and a spirit of sportsmanship on the part of those who lose the mandate. The BJP has not yet accepted the fact that it was defeated in the elections, nor has it understood the reasons why it lost. So certain the BJP leaders were about returning to power that they started believing that the Manmohan Singh government will not last beyond September 26 - a date a Delhi astrologer had configured. The Come-September mood seems to have given way to a cold winter. Misguided by its own notions of indispensability and inability to think that its constituency had further shrunk because of the Gujarat riots and its restrictive appeal to Shining India, it would not easily accept the role of a responsible opposition. The result, unfortunately, was its decision to block the functioning of Parliament and a boycott of discussion on the new government’s first budget. Much later the BJP leaders realised that the party’s confrontationist attitude towards the new government was alienating those very people — the members of the Shining India class — it had sought to cultivate. At the end of the year, the BJP was still struggling to come to terms with itself and the logic of its electoral defeat. While its performance at the polls should have led it to give up its addiction to Hindutva, and all that led it to launching the Ayodhya movement and the traumatic destruction of Babri Masjid as also to the Gujarat killings later, there are no signs that the party has thought of accepting changes required to face challenges of the emerging India. Mr Atal Bihari Vajpayee, at 81, fully knows that a father figure like him will be shown respect by the party but cannot continue to command avid support from his party indefinitely. Mr L.K. Advani, who is only a little younger than Mr Vajpayee, may have to watch the proceedings in the party involving Mr Arun Jaitley, Mr Pramod Mahajan, Mrs Sushma Swaraj and Ms Uma Bharati from the sidelines. The transition from the old to the new leaders may not, however, be coming easy to the seniors in the BJP. On the other hand, the Congress party is also placed in a situation in which it cannot have its way in the running of the coalition at the Centre. It has not been able to get rid of ministers like Taslimmuddin because it cannot say ‘No’ to its ally, Mr Laloo Prasad Yadav. Its economic policy has often to contend with the views of the CPM’s ideology. The DMK’s politics would always be dictated by the Tamil Nadu politics which can always be fickle. Like Mr Vajpayee, Dr Manmohan Singh has a coalitional mindset and wants to carry others along, but he cannot allow some of his colleagues to take him for granted. They do make statements at times which often embarrass him and his government and succeed in creating confusion which the Prime Minister has perforce to clear later. Dr Manmohan Singh is not given to arrogance that often comes with power, but beyond a point the Prime Minister does not have to punish himself with too much of modesty. His responsibility to the nation is greater than that of his colleagues and the people want him to succeed. He must be knowing that the principle that a Prime Minister is only first among the equals has already been given a go-by in most functioning democracies. India cannot be a prisoner of this outdated concept preached only in the textbooks on collective responsibility. Given the circumstances in which he assumed office, he cannot ignore the party. Luckily, he enjoys Mrs Sonia Gandhi’s support, which can be creatively used to tackle those colleagues who at present consult him only when they are asked to. The responsibility of running a nation of over a billion people places too much on the Prime Minister’s plate and the compulsions of coalition politics can indeed be forbidding. But somewhere someone has to begin an effort to rid the Indian politics of at least corruption, criminalisation and casteism. Among others, this wouldn’t be a bad resolution for Dr Manmohan Singh for the New Year to make. We were blessed with a mild shower of snowflakes at about four in the evening while strolling on the Mall. The flakes landing in the boiling oil, meant for frying pakoras at the nearby stalls, made crackling sound. It portended well for a pleasurable propagation of the ensuing evening. And a nice and hot cup of coffee out in the open, with a topping of the falling snowflakes, aptly allegorised the anxiety and trepidation in our hearts, since the Kandhar hijack hostages had not till then been released. Wherever we went, be it a restaurant, a showroom or a tea stall, the television channels constantly reminded us of the concern the entire nation had for the event, giving us mixed feelings of sorrow and joy, on the eve of the new millennium. We went to a cosy restaurant on the Mall and ordered soup while some people took to the dancing floor on the taps of the teasing disc jockeys. Updates on Kandhar hijack were beamed as intercuts during the other entertainment programmes but no news gladdened our hearts since it was just a wait and watch scenario which takes its toll with the people with sensitive hearts. We were invited to the podium and asked to tell a joke or sing a song. I could have gladly performed in pursuance of both the entreaties but something deep inside held me back. Battling through the crowd we made it to the dais but not without hesitation. And then the big news of the release of the hostages flashed on the small screen. Entire gathering went up in gyrations ranting cries of exhilaration, excitement and relief. It was a bare ten minutes short of the turn of the millennium. Never ever before had I enjoyed singing, “Chhoro kal ki baatein, kal ki baat purani; Naye daur main lickhenge, mil kar nai kahani; Hum Hindustani.” Needless to say the huge gathering sang in chorus with us clapping the beats that completed the most sought symphony of the moment. I noticed hardly a soul without moist eyes and revelling. Today our hearts go out to the bereaved family of Gurgaon and we salute the brave pilot. As the country enters the New Year 2005, the Left parties, who play a crucial role in the survival of the Congress-led UPA government at the Centre, have a daunting task of re-defining their role in the future. At the party level, they have to rejuvenate their cadre to the new reality that the world has become a global village and India cannot remain insulated to the benefits of liberal and economic policies. The verdict of 2004, perhaps, gave the Left parties, which had been confined to the two states of Kerala and West Bengal, to play a crucial role at the Centre. Here, the Left failed to rise to the occasion, even though it had secured over 60 seats in the Lok Sabha, its highest in parliamentary history. The arithmetic of the 2004 verdict is more to the Left’s advantage than in 1996 when the United Front was dependent on a numerically stronger Congress. A 145-member Congress could not brush away the concerns of an ideologically cohesive Left Front. Despite the advantage and difference within the four left parties — CPI, CPI (Marxist), Revolutionary Socialist Party and All India Forward Bloc — on joining the government, they decided to support the government from outside. Yet, it did not want to vacate the place of Opposition in the House as it would take the sheen out of its armour. The challenge before the left was to use the economic reforms and globalisation to remove poverty and deprivation. This is the mandate of the common people. In a sense, the left has already betrayed the mandate by shirking responsibility. So, what the party adopted was an approach of “unity and struggle with the UPA”. It united to give stability to the Congress-led UPA government at the Centre. At the same time, it criticised the policies of the government, especially the economic, as it was not in tune with their ideological thinking. They also halted the repeated hike in petrol prices and forced the government to fulfil its budgetary promise of allocating 6 per cent of the GDP on education and to introduce the National Rural Employment Guarantee Bill in the winter session of Parliament. Similarly, a Bill on right to information was introduced to pave the way for an accountable and responsible administration. Though they also tried to shift the focus of the National Common Minimum Programme on agriculture and rural poor, nothing tangible has emerged so far. The Left parties expressed their dissatisfaction over the functioning of the government, particularly its reluctance to restore 9.5 per cent interest rate on EPF. They were also unhappy with the government for not resolving the issue of FDI in core sectors — telecom, civil aviation and insurance. The debate on labour laws also continued with the Left’s frontal organisations slamming the government for not taking measures to amend the Payment of Bonus Act, and Payment of Gratuity and contract regulation Act, among other things. Left parties reviewing the performance of the UPA government said in the last six months the Centre has taken steps which are in violation of its promises in the Common Minimum Programme, which formed the basis for its support to the Union Government. The challenges in the coming year, the Left parties feel are compounded by two crucial factors. One, on the question of economic policies, most of the parties in the country are prone to toeing the World Bank-IMF line to one extent or another and thus the Left has to ensure, virtually single-handedly, that the common people’s life standard is not eroded. Secondly, though the people of this country are overwhelmingly secular, the parties whom we call secular are not together but divided into many camps. Not to talk of the parties that professed to be secular but lined behind the BJP, even the non-NDA secular parties have not been able to put up a united fight against the communal combine. This has its own perils, and the Left has to do its best to bring these parties together on the issue of secularism and national unity even if this task is extremely daunting. The rhetoric of the Communists today seems to be caught in a time warp. It is concerned with issues like stalling the reform process, which is to hark back to the fifties when a planned economy was considered a viable alternative. There are elements of the absurd and the hypocritical in this because in West Bengal, where the communists have been in power for over 25 years, the Chief Minister is busy wooing foreign business corporations to invest in the state. At the party level, the two main Left parties, CPI and CPM, would hold their national Congress in the first quarter of 2005, where they would decide on the tactics to be followed in the next couple of years. With the talks of leadership change in the CPM, it is hoped that the generation-next leadership handles realities of 21st century in a realistic manner than dogmatically following the writings of the 19th century. The meeting of the highest decision making body of both the parties also provide an opportunity to ponder over the talks of unity between them as little difference is left between them as they have come to follow the dream of P.C. Joshi, who was the general secretary of the Communist Party of India for a long time. Joshi argued that the communists and the Congress should work together and they would be able to build a just and fair society and polity in India. The communists should be part of the national mainstream; otherwise they run the danger of being marginalised and of being cut off from their national roots. He advocated a national front at the core of which would be Congress-communist unity. The red flag and the tri-colour should fly together as the symbol of India. He was fond of saying that the communists should be the mahouts of the Congress elephant. What strategy the communists adopt in 2005 would be crucial for their own existence in a world where dogmatic Marxism is losing its shine to the Centre-Left politics. Will they rise to the occasion or not would be keenly watched. There were no howling winds, no stormy skies, just wave after wave, higher than houses, bringing unimaginable destruction. Families, homes, businesses were ravaged in a flash. Millions are homeless; for them there will be no happy new year, just the start of a long struggle to rebuild their lives and come to terms with all they have lost. For those among us who have not been impacted directly, it is not easy to grasp the enormity of the disaster. The newspapers carry grim pictures of the devastated, and every morning reports a higher death toll. The debris and the sea, one fears, will disgorge more in the days to come — fishermen on the Tamil Nadu coast have a saying: those that the sea consumes, but loves, it brings back in five days. Television carries snippets, caught on tourist cameras, of the waves flooding and washing out hotels; of mothers whose eyes ask, why my child and not me; of stunned orphaned children with lost innocence. After a while, one moves on to other news — cricket, the Ambanis, and the latest restaurant in town. But like the tsunami, its news pulls one back. For no sensitive Indian should it be possible to walk away from this news without asking, what can I do to help? If nothing else, will the pictures of Swedes, Swiss and Norwegian voluntary relief workers flying across continents to help while we sit back, move us? Parliamentarians of the Congress Party were quick to announce that they would contribute a months salary for relief. Thank you leaders, for, well, leading. Corporates around the country are, with their employees, collecting and contributing directly or through various chambers of commerce. Only the largest donations of course make the headlines and probably earn brownie points for social responsibility, but the money counts as much as the thought. One hopes that the multinationals now operating in India will show too that global-expertise-local-commitment is not only a marketing slogan. Similarly one hopes that self-employed professionals--doctors, lawyers, chartered accountants, consultants, and fashion designers distinguished in their profession and among the wealthiest sections of society will also come forward to contribute, and motivate the small businesses that they can influence to do the same. Time will heal and move on, better for some worse for others. We will never know how and whether our help really made a difference. But that is not the point of giving, is it? When Mother Teresa said, “give till it hurts”, she in her simple way captured the essence of giving – the element of sacrifice. So this new year, celebrate as you will, but like a day of abstinence balances one of excess, give for the flooded beaches as much as you would to the bar. Stop the music for a moment, pray, and in silence, reach out. Love always unites. It does not divide. When Kings assemble to vie for the hand of a lovely princess, they try to outdo each other in scattering presents, food, gold and other wealth. It is the poor who benefit from it. They bless their lovely princess. You cannot love two people perfectly but you can love all people perfectly if you love the one Jesus in them all. This means that one should center mind and heart, life, and activity on Jesus, seeing Him in every human sufferer.